Cal Newport is the best-selling author of such books as So Good They Can’t Ignore You: Why Skills Trump Passion in the Quest for the Work you Love and How to Become a Straight-A Student: the Unconventional Strategies Real College Students Use to Score High While Studying Less. Cal teaches computer science at Georgetown University in Washington DC. The following interview is over Newport’s latest book, Deep Work: Rules for Focused Success in a Distracted World (http://www.amazon.com/Deep-Work-Focused-Success-Distracted/dp/1455586692/ref=asap_bc?ie=UTF8). Moore: Give our readers a feel for the impetus behind writing this book. Newport: We spend so much time wringing our hands over distraction that we’ve forgotten what’s so valuable about its opposite. If you hone your ability to work deeply, and prioritize this activity, you’ll become much more successful, and your professional life will become more satisfying. This seemed like a message worth sharing. Moore: You provide some wonderful examples (including your own) of those who have been able to accomplish considerable work-related goals without being stressed workaholics. Why do most of us equate productivity with long hours and significant stress? Newport: Not all work is created equal. If you spend all day answering emails between jumping on calls and attending meetings, you might feel busy, but you should not feel proud. You did very little that created new value or made you better at your craft. Once you recognize the value that true deep work creates, it becomes easier to treat the shallow alternative with suspicion – a nuance at best, a serious obstacle at worst, in your quest to make an impact on the world. Moore: A computer scientist can’t be a Luddite, but you find Facebook and Twitter a waste of time. However, you do regularly blog. Personally, I am in the same boat: regular blogging, but no Facebook and Twitter. Preach to the non-choir who think Facebook and Twitter are the best things since sliced bread. Newport: There’s a difference between being a Luddite and being picky about which technologies you allow to lay claim to your time and attention. There are a lot of technologies I love. But there are also a lot that I think are nonsense. I include most social media in the latter category. These commercial services are cleverly designed to prey on your quest for social approval and craving for lightweight distraction so that your eyeballs and personal data can be harvested then sold to advertisers. I have a hard job and two young kids at home. I want to preserve the small amount of free time that remains in my life for more meaningful pursuits. Moore: During my time in radio I had the opportunity to interview Neil Postman for the hour. He was insightful in writing about the tradeoffs which come with new technology. Unpack that a bit for us. Newport: Neil was a gifted and influential media critic. Among the many things he wrote about, an idea of his that stuck with me is the danger of the “technopoly.” In short, he warned that we have a tendency to deify new technologies as being intrinsically good and a prophetic source of wisdom regarding how best to run our governments, companies, and personal lives. I think we’re definitely seeing this play out today. When I say, for example, that Facebook is stupid, even if not everyone agrees with this claim, this really shouldn’t be that controversial—but I find instead that it throws people into a tizzy. This is the mark of a technopoly: dissent is seen as desecration not debate. Moore: You have to do a lot of “deep work” for your role as college professor and writer. Should the rest of us be concerned about setting up our schedules in such a way that we can also do deep work? Newport: Yes. Deep work is like a super power for many, many different knowledge work professions. To quote The Economist: “Deep work is the killer app of the knowledge economy.” There are three reasons to embrace deep work. First, if hone your ability to concentrate, you can produce significantly better output in significantly shorter time. Second, deep work allows you to learn complicated things quickly. And third, it makes your life more meaningful and satisfying. We were created to create things of value—not send emails. Moore: I found your book a great encouragement for what I am doing right and a further motivation to tweak my schedule so as to allow for increased deep work. Two book projects are propelling me forward! What would you say are a few reasons why people ought to consider buying your book? Newport: The book has two parts. The first part makes the case for deep work. If you’re on the fence, or if you’re a believer but want more ammunition to convince others, you’ll find what you need in part one. The second part provides detailed practical instructions for how to better cultivate and apply deep work in your own life. So if you’re looking to improve your ability to work deeply, this part will provide exactly what you’re looking for. This entry was posted in Business, Interview, Learning/Education, Personal Organization on April 11, 2016 by Dave. 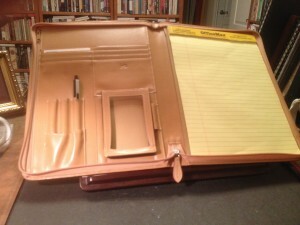 For used books, and a whole lot of other things like this nifty Lodis organizer for a whopping $1.99. This entry was posted in Personal Organization on April 8, 2016 by Dave. A friend who was a CEO at the time asked me how to help one of his employees who just couldn’t get through his emails. He had 10,000 emails collecting in his inbox! Immobilized by his perfectionism he just did not know how to get traction. Another friend sheepishly asked how I handle long emails from folks who are asking me for counsel. I asked him what the longest he had waited to respond to someone, and he proceeded to tell me that our conversation marked the ten year anniversary of an email which he still had not addressed! I asked him if he knew whether this person was still alive and I recall him saying he was not sure. In light of these and lesser challenges with email, I came up with my own system for dealing with the daily deluge of email: RIP. R is for email you can respond to right away. I use the one minute rule. If I can respond within a minute, I usually do it at once. I is for incubate. When I receive a large email asking for some kind of action, I respond right away with something like this: “Thanks for your email. Right now, I am not able to address it. Please give me a few weeks and I will circle back to you.” Here is what happens on a fairly regular basis: The person thanks me for responding right away and appreciates that it may take some time. When I finally get back to responding, I many times find out that either my correspondent got his answer elsewhere or that it is no longer of importance to him. It is common for people to write stuff, even long things, only later to realize it is not so pressing after all! P is for pitch. This is the junk email. Junk email grows so you have to be crystal clear about what really matters to your own calling in life. So start RIPPING through your email and keep your inbox under control. This entry was posted in Personal Organization on May 16, 2013 by Dave.